Anthony Schulte was also known as Anton or Tony. His naturalization papers described him as being 5ft 5in tall, with blue eyes and dark hair. He was born on 9 July 1857 in Kirchilpe, Westfalen, Germany to Anton and Margaretha (Noellecke) Schulte. He was christened on 10 July 1857 in the Catholic Church in Dorlar, Westfalen, Preussen. His godparents were Anton Schroder and Theresia Schulte. The priest of record was Father Schoene. Kirchilpe is nearby Altenilpe where Anton's future wife, Wilhelmina Knoche was born. But they did not get to know each other until they were both living in Detroit, Michigan in the late 1880's. 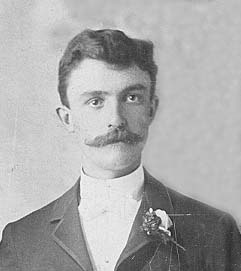 Anthony became a U.S. citizen on 2 April 1892 in Detroit. He and his younger brother, August, departed from the port of Bremen, Germany on the ship Oder, and arrived in New York at Castle Garden on 16 October 1880. Anthony co-owned and operated a grocery store for over twenty years called Schulte & Erdman Groceries & Liquors, located at 932-934 Congress. His daughter, Lidwina, said her father was the first grocer in the city to offer delivery. He married Wilhelmina Knoche, daughter of Johann Joseph Knoche and Elisabeth Voss, on 23 April 1890 in Detroit. Father U. Walersinski officiated. Michael Geck and Elizabeth Wiethoff witnessed the ceremony. Tony and Minnie had nine sons and two daughters, the youngest born in 1906. A prominent article with photo in the Detroit Free Press of 17 May 1907 mentioned Anthony belonged to several organizations. He was also a member of the Westphalia Shooting Club in Detroit, comprised mostly of businessmen from the Eastern Market area, which was located on Gratiot opposite the old Hessian Road from 1898 until about 1915. After rallying from an illness which caused him to spend the winter in Asheville, he had a relapse and died at his home at 949 Congress at 2 a.m. on 16 May 1907 of acute lobar pneumonia at age 49. He had seemed much improved when he returned home six weeks previously. Anthony's funeral began at his home and continued at Our Lady of Help Catholic Church. He was buried on 20 May 1907 at Mt. Elliott Cemetery in Detroit.